Map of the Northern Russian region detailing the location of the conflict. 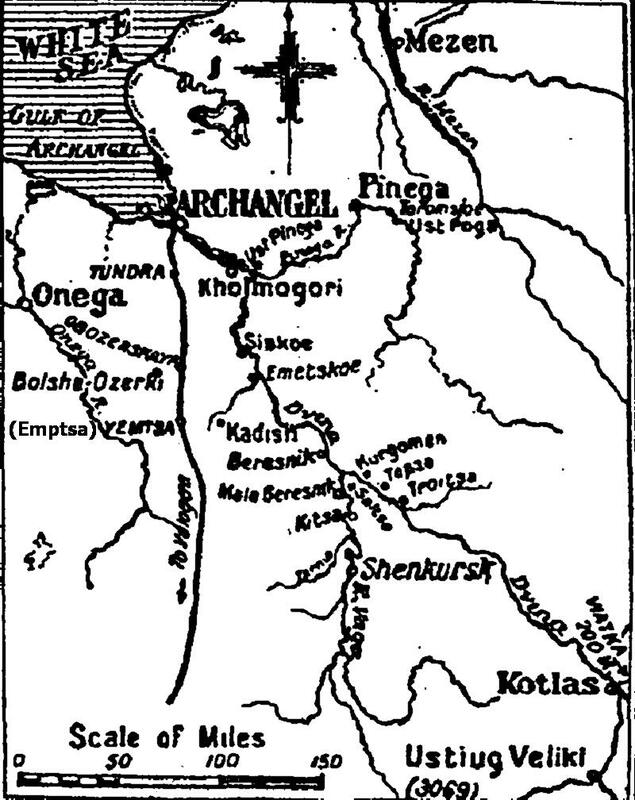 Emptsa, a town in northern Russia about 200 kilometres south of Archangel (now Arkhangel'sk) on the railway line to Vologda, which on 29 August 1919 was the scene of an action between Bolsheviks and British troops and their White Russian allies. The British were part of a two-brigade expedition, the North Russia Relief Force, which had arrived in mid 1919 to cover the withdrawal of a detachment of advisers sent the previous year to train White Russian forces. Among its members were 100-120 ex-AIF men recruited in England and enlisted mainly in the 45th Battalion, Royal Fusiliers, and the 201st Machine Gun Battalion. 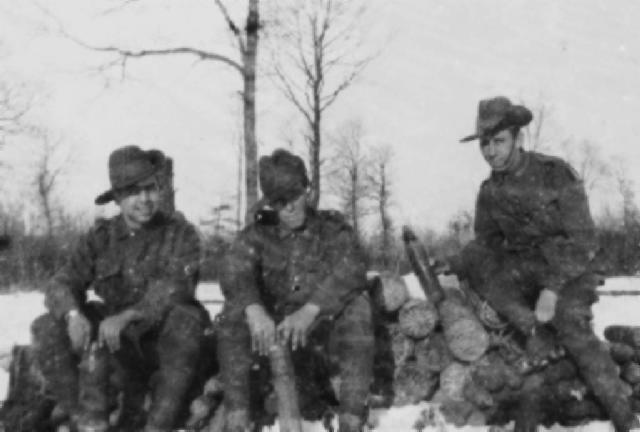 While these volunteers were no longer the responsibility of the Australian government, within their units they still formed a distinctive national group. Three Australians sitting by a stack of shells. The attack on Emptsa was undertaken to enable White forces to consolidate their positions before the final British withdrawal, and involved the Australians spearheading the assault with White Russian support. Although the Bolsheviks were taken by surprise, some put up a spirited fight before the defenders fell back across the river and demolished the steel railway bridge behind them. Over 1,000 Bolsheviks were taken prisoner during the day. A highlight of the engagement was the part played by Sergeant Samuel Pearce of the 45th Battalion, a Welsh-born Victorian, in assaulting the enemy batter position north of the town. After cutting his way through barbed-wire obstacles under heavy rifle and machine-gun fire, he saw that fire from a blockhouse was harassing the advance and causing casualties. He accordingly single-handedly charged the blockhouse and killed its occupants with hand grenades, moments before being himself cut down by another enemy machine-gun. For his bravery Pearce was subsequently awarded the Victoria Cross - one of only two such awards for service in northern Russia (and both of which were to ex-AIF soldiers). Machine gun blockhouse manned by Australians. Extracted from the book produced by Chris Coulthard-Clark, Where Australians Fought - The Encyclopaedia of Australia's Battles, Allen and Unwin, Sydney, 1998, p. 165. Lionel Wigmore (1963) They Dared Mightily, Canberra: Australian War Memorial. Peter Burness, 'The Forgotten War in North Russia', Defence Force Journal, No. 22, May-June 1980. 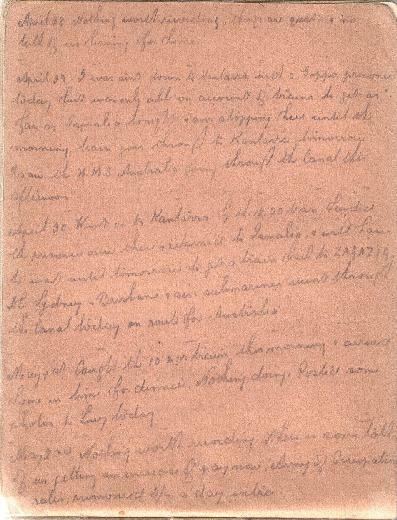 Bert Schramm's Diary - Caught the 10 am train this morning and arrived home in time dinner. Nothing doing. Posted some photos to Lucy today. 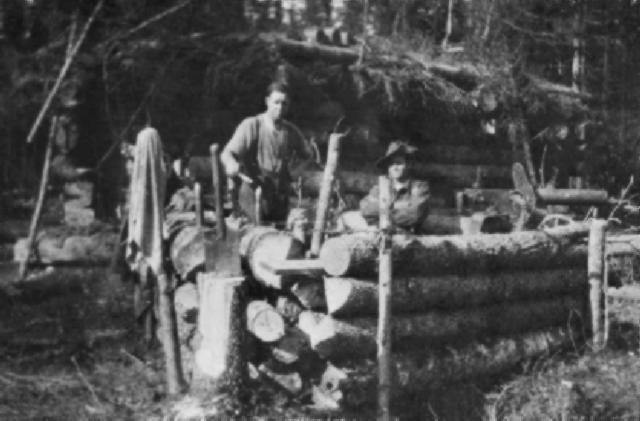 9th Light Horse Regiment War Diary - Usual camp routine. Driscoll, Lieutenant LS, evacuated to hospital.